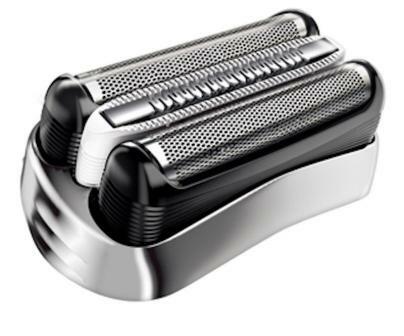 Will only work with the new series 3 shavers that have the foil and cutter cassette unit in one. Also available is 32B same product but in black instead of silver. type 32B in search box to purchase. For Braun Series 3 (Type 5416, 5415, 5414, 5412, 5411) Models: 390cc-4, 380s-4, 370cc-4, 370cc, 350cc-4, 350cc-3, 350cc-2, 350cc, 340s-4, 340s-3, 330s-4, 320s-4. For Braun Series 3 (Type 5779, 5776, 5775, 5774, 5773, 5772) Models: 395cc-3, 390cc, 380, 370cc, 370, 360, 350cc, 340, 330, 320. *Check your shaving head type number on the back of the shaver, on the shaver housing under the cutterblock or under the long-hair trimmer. If your model Braun 390cc has the on/off switch on the front of the shaver then the parts you require are Braun 32B (Black Cassette) or 32S (Silver Cassette). If you own a Braun 390CC with the on/off button on the side then you require replacement parts Braun 31B (Black) or 31S (Silver) You can type just the part number into the quick search box at the top left hand side of the page to view and purchase the correct part. Braun 32B New Series 3 Black Cassette Foil & Cutter Pack.